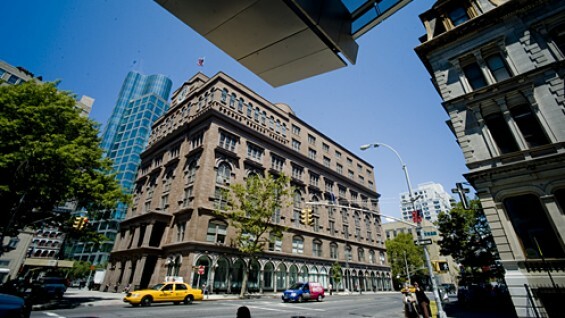 The Cooper Union for the Advancement of Science and Art, established in 1859, is among the nation's oldest and most distinguished institutions of higher education. The college, founded by inventor, industrialist and philanthropist, Peter Cooper, offers a world-class education in art, architecture and engineering as well as an outstanding faculty of humanities and social sciences. From the start, Cooper Union was a unique institution, dedicated to Peter Cooper's proposition that education is the key not only to personal prosperity but to civic virtue and harmony. “Wisdom's ways are ways of pleasantness and all her paths are peace,” he quoted Proverbs in his original charge to the Board of Trustees. Peter Cooper was not a man who engaged in empty rhetoric. He made his school free for the working classes. He took the revolutionary step of opening the school to women as well as men. There was no color bar at Cooper Union. Cooper demanded only a willingness to learn and a commitment to excellence, and in this he manifestly succeeded. It was obvious to Cooper that not everyone would be able to enroll in a full time course of study. He opened a public reading room and stocked it with the latest newspapers and periodicals. Over time, poor immigrant children, such as future Supreme Court Justice Felix Frankfurter, found it a quiet haven in the hurly-burly life of the lower east side. Peter Cooper wanted his school to play a role in the political and cultural life of his city and country. The means he chose was the establishment of the Great Hall in the basement of the Foundation Building. It seated 900, the largest secular meeting room in New York and soon after it was opened. It made history when Abraham Lincoln, an unannounced candidate for president of the United States, and a virtual unknown in New York, was invited to speak there by the Young Men's Republican Union. To some it seemed a strange invitation; Peter Cooper had served as a Jacksonian Democrat on the New York Board of Alderman. But he was also an ardent enemy of slavery and he was glad to provide a forum for the young lawyer from Illinois. The address Lincoln gave, which has come to be known as his “right makes might” address, aroused the country. “No man ever made such an impression on his first appearance to a New York audience,” wrote the New York Tribune. Lincoln himself credited the speech at Cooper Union with a major role in his rise to the White House. The alliance between Lincoln and Cooper solidified during the Civil War. In 1863, in the face of strong northern opposition to Lincoln's plan to welcome former slaves into the Union army—and thereby take a major step toward emancipation—Cooper sent the commander in chief a public letter of support. “I believe with you,” he wrote, “that it is impossible for a people who are determined to perpetuate slavery at the expense of all the horrors of a civil war, to continue to hold slaves and live in peace with a government having its foundation on the equal and inalienable rights of men.” For Cooper, as for Lincoln, this was both a matter of morality and practicality; allowing slaves to fight on would give the Union a powerful new weapon. After emancipation, Cooper invited Fredrick Douglass to the Great Hall to defend the policy. Peter Cooper's abolitionism was consistent with his generally progressive social views. He was a strong advocate for the rights of Native Americans and lobbied President Grant to adopt a peace policy in the west. In the 1870s, at a time when Indians were widely regarded as enemy savages, great leaders like Red Cloud, of the Lakota Sioux and Little Raven, chief of the Arapaho, were given the lectern at the Great Hall. Cooper was also a fighter for women's right who opened the doors of his institute to Susan B. Anthony and Elizabeth Cady Stanton. Cooper Union's Great Hall was not only a forum for famous orators. It was also conceived as an arena for teaching students the skills of debate and democratic leadership. Peter Cooper, in his charter, established a student government that would play an active role in the administration of Cooper Union and he mandated term limits so that the largest possible number of students could play an active role. Cooper anticipated Lincoln's Gettysburg address, asserting that “true republican government'” should be “for the people and of the people.” He saw democracy and Constitutional rule as the only way to preserve personal liberty, encourage prosperity and initiative and “afford the best means possible to elevate our race”--by which he meant, the human race. Cooper was a man of his city—he lived and died only a few miles from his place of birth near the docks of lower Manhattan—and an American patriot, whose office featured portraits of his heroes, Washington and Lincoln. Between them hung a portrait of Lafayette, a reminder of the world beyond the borders of the United States. Although the phrase had yet to be invented, Cooper was a global thinker. “My feelings, my desires, my hopes, embrace humanity throughout the world,” he proclaimed in a speech in 1853, and he looked forward to a time when, “knowledge shall cover the earth as waters cover the great deep”--a sentiment that took on a particular resonance after his efforts led to the success of the transatlantic cable that connected continents.